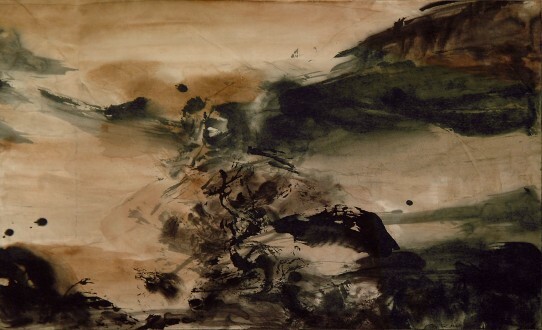 The best-known Chinese artist in the West, Zao Wou-Ki, combined his Eastern heritage (which already integrated calligraphic semi-abstraction), the abstraction of contemporary Western artists and traditional oil painting techniques. He summed this up when he told Claude Roy: “Picasso taught me to draw like Picasso. But Cézanne taught me to take a different look at Chinese nature” (Le Musée de Poche, 1957). A member of an ancient T’chao family, with its roots in the Song dynasty, Tchao Wou-Ki became in France Zao Wou-Ki (Wou-Ki being the first name). From the age of 10 he drew and painted in an unconventional manner. Although they were not particularly enthusiastic, his family did not however oppose his wish to become an artist. Predisposed by being born into a family of intellectuals, in which considerable interest was shown for art, Zao Wou-Ki was taught by his grandfather that calligraphy becomes an art form when it is brought to life. His father, a banker, was also an amateur artist, and his uncle brought him back from Paris postcard reproductions of paintings. At the age of 14, after passing the entrance exam, which involved drawing a Greek statue from a mould, Zao Wou-Ki was admitted to the Hang-Tcheou School of Fine Arts. During the six years he spent there (1935–1941), he learned, in addition to traditional Chinese painting, to draw from a plaster cast or model and to make copies, as well as the qualities of the Western perspective. In addition to this academic teaching, distanced from realism, he painted landscapes in which he attempted “to discover the unity of the object, beyond anecdote”. In 1941 he was made an assistant at his school and had his first exhibition at Tchoung-King. His early works were influenced by Picasso, and above all by Matisse and Cézanne. In 1947 Zao Wou-Ki had his last solo exhibition in Shanghai before he left China, after obtaining his father’s reluctant agreement. He landed at Marseille with his wife Lan-Lan on 26 February 1948, after 36 days at sea, and the couple reached Paris on 1 April. Zao Wou-Ki spent his first afternoon in the city at the Louvre. They moved into a small hotel at number 51 bis rue du Chemin-Vert, next to the hotel in which Giacometti was then living. Zao Wou-Ki took classes in French at the Alliance Française and attended the Grande Chaumière, where Friesz corrected his drawings of nudes. He said that he had chosen to live in Paris because of impressionism. During this period he made friends with Riopelle, who had arrived from Canada, and also with Sam Francis, who had arrived from New York, in addition to meeting Soulages, Hartung, de Stael and Vieira da Silva at the Galerie Nina Dausset. He began to collect the works of these artists. He applied for a place at the Beaux-Arts, although Souverbie assured Zao Wou-Ki, after looking at his work, that he already had sufficient knowledge. He enrolled nonetheless and, driven by a desire to learn about Western art, travelled around France and visited its museums. In February 1949, Zao Wou-Ki won the first prize in a drawing competition whose jury included Lhote and Gromaire. He learned the technique of lithography at the Desjobert print workshop. In May 1949 Zao Wou-Ki had his first solo exhibition at the Galerie Creuze. In his preface Bernard Dorival wrote: “Chinese in their essence, modern and French in certain respects, Zao Wou-Ki’s paintings accomplish a pleasing synthesis.” The exhibition was well received. Jacques Villon, who had been among those who appreciated it, enabled him to participate in the Salon des Tuileries, and Zao Wou-Ki also showed for the first time at the Salon d’Automne. Henri Michaux, with whom he commenced what was to be a long friendship, took Pierre Loeb to visit his studio. When the dealer returned in January 1950, he bought 12 paintings, and they signed a contract. Zao Wou-Ki worked with Loeb from 1950 to 1957. Printed in 1949 at Desjobert, his first eight lithographs were shown in 1950 at the Galerie La Hune. Robert J. Godet showed these prints to Henri Michaux, who was inspired to write a number of poems that appeared alongside the prints in a volume titled Lecture de huit lithographies de Zao Wou-Ki, which was shown in the exhibition with another work: Les notes by Gaston Bachelard, with engravings by Albert Flocon. Zao Wou-Ki also produced an album of six lithographs to illustrate a text by Harry Roskolenko, Paris-Poèmes. The same year, he took part in the Salon de Mai, at which he became a regular participant. In 1951 the Swiss publisher Nesto Jacometti presented a series of Zao Wou-Ki’s prints at the Galerie Klipstein in Bern and the Galerie Laya in Geneva. The artist travelled to Switzerland for these events and for the first time saw works by Paul Klee in museum collections there. This was a significant moment in Zao Wou-Ki’s career: Klee’s inner world corresponded in some respects to his own sensibilities and he acknowledged that he had followed the same path: influenced by Chinese art, Klee refers to the sign and introduced Zao Wou-Ki to the world of Western painting. Zao Wou-Ki remained influenced by Klee’s work until 1953. Forests, landscapes, buried cities, seascapes, views of Venice and birds all indicate an Eastern conception of art and the influence of the brushwork in Chinese watercolours. In 1953 he designed the stage sets for Roland Petit’s Ballets: La perle by Louise de Vilmorin, put to music by Claude Pascal and performed at the Théâtre de l’Empire. There was a new exhibition of watercolours and lithographs at La Hune and solo exhibitions in Bern, Rome, Geneva and Munich. Zao Wou-Ki painted with the canvas placed against the wall or on the floor, which allowed him to be completely involved in the creative process. He shared this manner of forming a single body with the work with the representatives of informal abstraction, currently emerging as a force to be reckoned with, although speed was not an important criterion for him, as it was for some of the proponents of this new style of painting. For Zao Wou-Ki, space was dependent on the gesture. The painting Vent (Musée National d’Art Moderne, Paris) marks the beginning of this new period. In May 1955 he had his second exhibition at the Galerie Pierre: “Zao Wou-Ki’s work shows well how the Chinese vision of the world, where the vague and distant reflect a spirit of contemplation rather than the thing contemplated, has become a universal modern vision. Men as different as Paul Klee, Mark Tobey or Henri Michaux, have also resorted to it,” and also: “Making the world visible is, for Zao Wou-Ki, to compose a space where light and shade, the sociable and the base, the near and the far mingle in a single overall vision. The scale of Zao Wou-Ki’s works, which we would be mistaken to consider from the viewpoint of abstract art, derive from the fact that they correspond to an attempt to reconcile all forms of perception,” wrote Alain Jouffroy in Arts, 1 June 1955. Disorientated, the public did not understand, and for two years his dealer did not sell a single piece. Music is at the centre of Zao Wou-Ki’s work and contributes to enriching it. The artist painted while listening to Bach or Mozart and also to Debussy, Bartok, Webern and Satie. In 1954 he joined the Domaine Musical, which had recently been founded by Pierre Boulez. The following year he met Edgard Varèse, who was to be a close friend until the latter’s death in 1965 (in 1964 he painted a tribute to Varèse, priv. coll. ), and who was in Paris to direct Déserts at the Théâtre des Champs-Elysées (1954). This work contributed to the change occurring in Zao Wou-Ki’s style. “This desert which is both physical and moral expresses in its sonorous paroxysm a vision of the world which has never ceased to obsess me. Since then, I have tried to balance light with other pulsions” (Daniel Abadie-Martine Contenson Zao Wou-Ki, Ars Mundi, 1988). Since 1955 and a meeting in 1950 with Gildo Caputo and Myriam Prévôt at the Galerie La Hune, Zao Wou-Ki had had contract with the Galerie de France. In 1957, after reaching an agreement with Pierre Loeb, the artist signed an exclusive contract with the latter’s gallery, where he exhibited until 1986. His first exhibition at the gallery, in May 1957, despite testifying to his passionate creativity, generated controversy. René de Solier wrote a text, Signes d’éléments, in which he said: “In this period of stains without a subject, empty crownings of silent lyrical expression, Zao Wou-Ki’s painting is violently charged with meaning, with a weight of signs not without profusion. Signs no doubt indecipherable by the illiterate Westerner, but known to the artist.” Pierre Restany observed “a slow dissolution of the sign in the picture plane” (Cimaise, May 1957). Zao Wou-Ki illustrated Les compagnons dans le jardin by René Char (Broder) with four colour etchings. In 1957 and 1958, traversing a difficult personal period after which he eventually separated from his wife, Zao Wou-Ki travelled round the world, a journey which had an enormous influence on his work. In New York, which impressed and fascinated him, he lived with his brother, once more meeting Varèse as well as the architect I.M. Pei, to whom Zao Wou-Ki was related. He also met the dealer Samuel Kootz, who showed Zao Wou-Ki’s work until his gallery closed in 1967 (in 1958, 1959, 1961, 1964 and 1965, with Zao Wou-Ki travelling to New York almost every year), as well as American artists such as Franz Kline, Marca-Relli, Gottlieb, Baziotes and Hans Hoffman, all of whom Zao Wou-Ki got to know. From New York he travelled with his friends Pierre and Colette Soulages to Washington, Chicago and San Francisco, visiting the museums, where he was amazed to find so many French paintings. The party continued on to the Hawaiian Islands, separating in Hong Kong. From there Zao Wou-Ki visited Japan, in the company of May, whom he had met and married, before returning to Paris with her in August 1958, via Thailand, Greece and Italy. In 1959 Zao Wou-Ki bought a house with a garden in rue Jonquoy, separated from the street by a warehouse which he had had converted into a studio by the architect Georges Johannet (who had also designed a studio for Vieira da Silva). He now worked in this large sparse room lit by a glass roof, his tranquillity undisturbed, as it had no opening onto the street. The finished canvases were turned to face the walls. Their titles disappeared, replaced by dates that simply indicated when the work had been completed. His painting became more fluid, marked by the passing seasons. Michel Ragon considered that Zao Wou-Ki drew this “abstract landscape” from deep inside himself. “Although the influence of Paris is undeniable in my development as an artist, I would also like to say that I have gradually rediscovered China as my personality has become stronger. In my recent works, it is conveyed in an innate manner. Paradoxically, it is perhaps to Paris that I owe this return to my deepest origins” (Panorama chrétien, 1961, survey on foreigners living in France). A number of exhibitions now followed abroad (list in the catalogues to the exhibitions at the Bibliothèque Nationale, 1979, and the Galerie Marwan Hoss, 1992), in Paris at the Galerie de France: 1960 text by Myriam Prévôt who quotes Lao-Tseu: “Great music, few notes. Great painting without an image.” Guichard-Meili wrote: “He naturally extends the very ancient Chinese tradition by a degree towards the abstract” (Témoignage chrétien, 8 July, 1960). 1963 text by François Pluchart. As often, the event generated abundant and divided press comment. For Pierre Schneider, Zao Wou-Ki’s works were “fuller and broader in their technique, more eventful than previously,” (L’Express, July 1964). A 1967 text by Pierre Schneider explained how the artist, starting from the image and reality and arriving at gestural painting, then went even further to capture “the passing of life, the sliding of the world beyond the indefinite towards nothingness,” and recognised that “in this painting… the invisible light which consecrates it belongs to Zao Wou-Ki alone”. There then followed the exhibitions of 1970 and 1972, in which Indian inks accompanied sculptures by May Zao, who had recently died. That year he travelled to China to visit his family, whom he had not seen since 1948. 1975 text by René Char, 1980 Indian inks with a text by Henri Michaux, 1984 text by Georges Duby. His final exhibition at the Galerie de France was held in 1986. From 1985 he showed his prints at Artcurial. 1988 retrospective, text by Pierre Schneider. We should also mention the exhibitions in Paris at La Hune, in 1956 (watercolours) and in 1962, on which occasion Pierre Restany remarked that the artist “has been permanently absorbed by the new École de Paris (tachist section). We would seek in vain… for the slightest reminiscence of the Far Eastern style for pleasing and exotic official tapestries,” (Cimaise, November 1962). In 1962 he showed 10 lithographs illustrating La tentation de l’Occident by André Malraux. The artist continued in the following years to make a large number of illustrations for works by Rimbaud, Saint-John Perse, René Char, Jean Lescure, Jean Laude and Roger Caillois. Zao Wou-Ki’s prints soon met with international success. In 1954 a first retrospective was held at the Cincinnati Museum. In 1955 Nesto Jacometti published the catalogue raisonné of the prints and lithographs from 1949 to 1954 (Bern). 1964 Dix ans de gravure, Galerie La Pochade, Paris. In 1965 a retrospective was held of his prints at the Albertina in Vienna (catalogue, text by Pierre Schneider). Major trips abroad continued to punctuate his work. Among the many group exhibitions in which Zao Wou-Ki took part during this period (the reader is invited to consult the complete biography in the catalogue of the Bibliothèque Nationale, 1979), the following should be mentioned: 1948 4 peintres chinois: Pan Yu-Lin, Siao Ling-Cho, San Yin et Zao Wou-Ki organised by the Information Office of the Chinese government in Paris, place Saint-Georges. 1952 1st Salon d’Octobre Paris, salle André Baugé, text by Charles Estienne; Young Painters of Paris travelling exhibition in British museums. 1954 Schneider, Tal Coat, Poliakoff, Zao Wou-Ki, Galerie Ariel, Paris; Friedländer et Zao Wou-Ki gravures, Cabinet des Estampes, Geneva; Pittori d’Oggi and in 1957, 1959 and 1961 Museum of Turin. In 1955 Jean Cassou invited Zao Wou-Ki to show in the French section at the 3rd São Paulo Biennial. Art 55 Musée Rouen. 1956 Dix ans d’art français, Musée de Grenoble, text by Gabrielle Kueny curator; Amis de l’art, Nantes. 1957 Cinquante ans d’Art abstrait for the publication of Dictionnaire de la Peinture abstraite by Michel Seuphor, Galerie Creuze, Paris; Prix Lissone. 1958 Orient-Occident, Musée Cernuschi, Paris; Exposition d’Art Contemporain, Musée de Nantes; Pavillon Français Exposition Internationale Bruxelles; Contemporary French Painting, travelling exhibition in Yugoslavia; Giacometti, Zao Wou-Ki, Vonderbank Print Collection, Frankfurt. 1959 Dessins des artistes de Paris, Galerie Creuzevault, Paris; Peintures d’aujourd’hui, Musée Grenoble; Salon des Tuileries, Nice; School of Paris the Internationals, with Appel, Hartung, Lanskoy, Riopelle, Schneider, Soulages et Vieira da Silva, Walker Art Center, Minneapolis; De Gauguin à nos jours, in several Polish cities; Exhibition of French painting, Dortmund, Vienna and Poland. 1960 Antagonismes, Musée des Arts décoratifs, Paris; Art et Jeunesse, Brest; Venice Biennial, French Pavilion invited by Jacques Lassaigne; Exhibition of Contemporary French Art, Göteborg; 2nd International Tokyo Biennial. 1961 exhibition organised by Philips at Unesco, Paris. 1962 Salon des Surindépendants, Paris; Diptyques et triptyques d’artistes contemporains, Galerie Creuze, Paris; Presentation of the Salon de Mai, Tokyo; French Drawing, Poland; Eight Paris Painters, with Appel, Bryen, Gischia, Le Moal, Manessier, Singier and Sugaï, Molton Gallery, London. 1963 Exposition lettriste, Galerie Valérie Schmidt, Paris, including Zao Wou-Ki and Hartung; Exhibition of Contemporary French Art, Yugoslavia; French Painting, organised by Jacques Lassaigne and Frank Mac Ewen, Salisbury Museum (Rhodesia); École de Paris, watercolours, American Federation of Art, New York; Soulages, Sugaï, Zao Wou-Ki, Kootz Gallery, New York; Rencontre internationale des artistes, Rabat; French Contemporary Art, Canada. 1964 Hors dimensions, large paintings, exhibition organised by Pierre Schneider at the Centre américain de Paris; Œuvres choisies de 1900 à nos jours, Galerie Kaganovitch, Paris; École de Paris 1964, with Hartung, Manessier, Soulages, Singier, Poliakoff, Alechinsky, Gonzales, Robert Muller, Galerie de France, Paris; Lourdes 64, tentative de renouveau pour un art sacré, invited by the Abbé Laurentin, with Hartung, Gilioli, Poliakoff and Lardera. 1965 Promesses tenues, Musée Galliéra, Paris; Sous le signe de Pausias, Galerie XXe Siècle, Paris; Salon de Mai in Poland; Art international, Skopje Museum; Contemporary French Prints, travelling exhibition in Berlin, Magdebourg, Halle and Leipzig; Contemporary French Art, exhibition organised by Bernard Dorival and Michel Hoog in South America. Invited by the Carnegie Institute Pittsburgh International in 1955, 1958, 1961 and 1963. École de Paris, Galerie Charpentier, Paris in 1957, 1958 and 1961. He has participated in many other exhibitions since. Zao Wou-Ki continued his elegant work, with its power to suggest and enchant. According to his friend and biographer Claude Roy: “His painting achieves a perfect balance between naturalism and abstraction… It is in harmony with that part of ourselves which continues against all odds, demons and anti-marvels, to believe in the ‘possible’ beauty of the world… It give us grace.” (Musée de Poche, 1970). Zao Wou-Ki exhibited his work in his own country for the first time in 1983. 1979 Rétrospective: œuvre gravé: Estampes, faisant partie de la donation Zao Wou-Ki à la Bibliothèque nationale. Catalogue, preface by Françoise Woimant and Claude Roy. 1981 Rétrospective: peintures, encres de Chine 1950–1981. Hommage. Grand Palais, Paris. Catalogue texts by Jean Leymarie and François Cheng. Biography, bibliography. 1988 Rétrospective: 1955–1988. Artcurial, Paris. Catalogue text by Pierre Schneider. Biography, bibliography. FIAC (Foire Internationale d'Art Contemporain) 1988, large recent paintings. 1992 Peintures: 1976–1991. Artcurial, Paris. Catalogue. Text by Pierre Daix Les espaces infinis de Zao Wou-Ki. Biography, bibliography. 1992 Les encres récentes. Galerie Marwan Hoss, Paris. Catalogue text by Philippe Dagen L’encre, l’eau, l’air. Biography, bibliography. Zao Wou-Ki’s work is represented in many international collections, particularly in the USA, Japan and France. Musée National d’Art Moderne and Musée d’Art Moderne de la Ville de Paris – Bibliothèque Nationale Paris – FNAC Paris – Manufactures Nationales des Gobelins, de la Savonnerie, de Sèvres – Musées Valence – Montauban – Le Havre – Chateauroux – Metz – Colmar. Claude Roy: Zao Wou-Ki, preface by Henri Michaux. Le Musée de Poche. G. Fall, 1957. Revised edition, 1970. Jean Laude: Zao Wou-Ki. La Connaissance, Brussels, 1974. Roger Caillois: Les estampes 1937–1974. Yves Rivière. Arts et Métiers graphiques, Paris, 1975. Henri Michaux: Zao Wou-Ki, Encres, discussion with Françoise Marquet. Cercle d’Art, Paris, 1980. Jean Leymarie: Zao Wou-Ki. Documentation by Françoise Marquet. Cercle d’Art, Paris, 1989. Claude Roy: Zao Wou-Ki. Les grands peintres, Cercle d’Art, Paris, 1988. Reprinted, 1992. Bernard Noël: Zao Wou-Ki, Encres. Librairie Séguier. Archimbaud, Paris, 1988. Zao Wou-Ki: Autoportrait. Fayard, 1988.